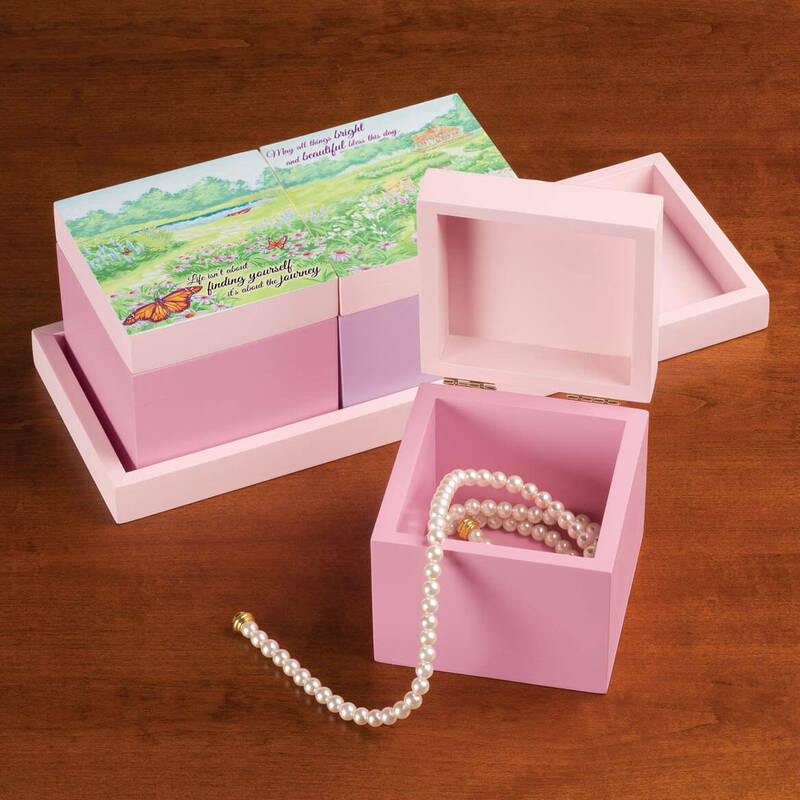 This is very cute and the 3 boxes are removable to store jewelry and other small stuff. Very nice for a young girl and older.I love the designs and the soft pink color. I ordered these as Christmas gifts for 12/19. They are nice. I figured I could put little trinkets in them. Down side is the scene on top is is taped on and not very well. I'll have to get some glue with a brush to fix the scenes. Still keeping them but am really glad I didn't pay full price. If I had, they would have been returned. They are pretty and great for putting jewelry or anything like that in them. I liked the look of these boxes for a lot of my jewelry items and they were on sale. I like little boxes for trinkets. BEST ANSWER: Thank you for your question.It includes 3 boxes (4" cubes with 3"D storage inside) and a base (13 ¾"Lx5"W)We hope this information will be of help to you. BEST ANSWER: Thank you for your question. 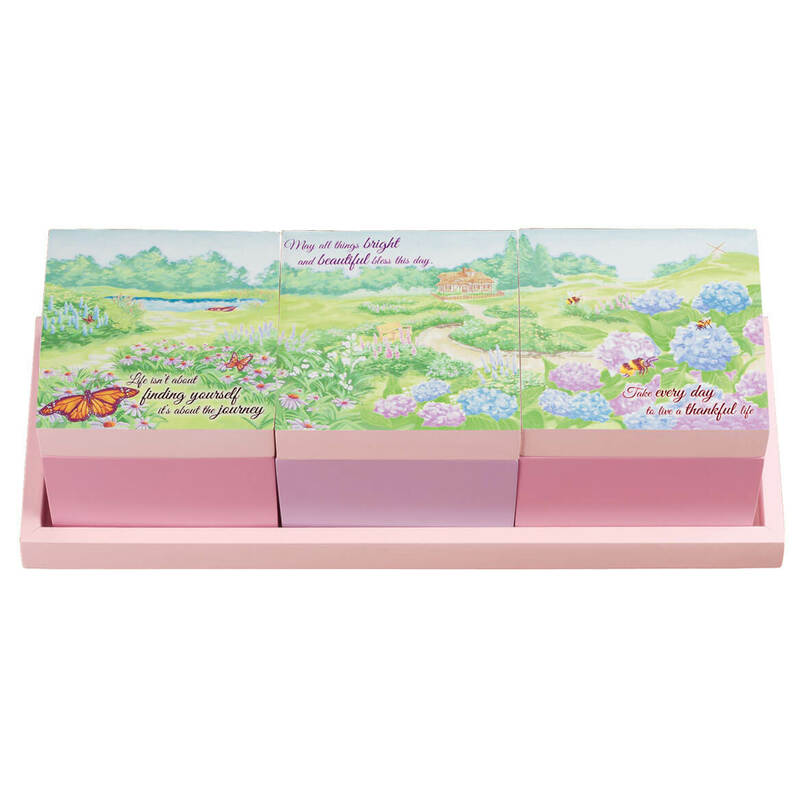 4-piece set includes 3 storage bin (4" cubes with 3"D storage inside) and a base (13 3/4" long x 5" wide). We hope this information will be of help to you.